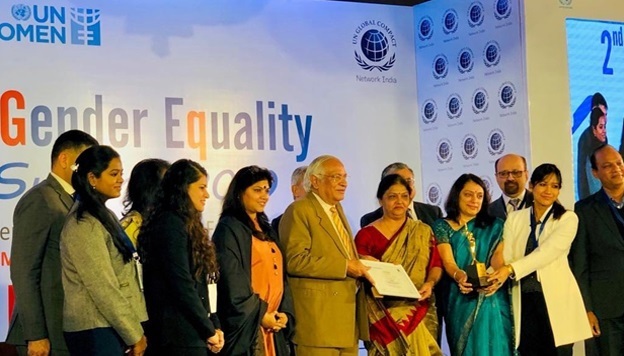 ONGC recently won the Best Innovative Practices Award for Women at Workplace at the 2nd Gender Equality Summit organised by Global Compact Network India on the theme “Preparing Women for the Future of Work”, at New Delhi. With 34 other organisations vying for the coveted award, both public and private sector, ONGC won the trophy after competing through two stages of evaluation – first, a written submission and second, case-study presentation before an eminent Jury. The evaluation of the case-studies was done on the basis of an evaluation matrix comprising of five parameters viz., 1) Enabling environment, 2) Safety & security, 3) Diversity, 4) Facilities and 5) Capacity development. The Jury who evaluated the winners for the ‘Case Study Competition’ were very appreciative of the exemplary work done by ONGC in taking the idea of Gender Equality: Goal No. 5 of UN Sustainable Development Goals (SGDs) to commendable heights.